Now in its fourth edition, this book provides detailed and practical guidance on how London Maritime Arbitration works in practice, against the background of English arbitration law and the Arbitration Act 1996. 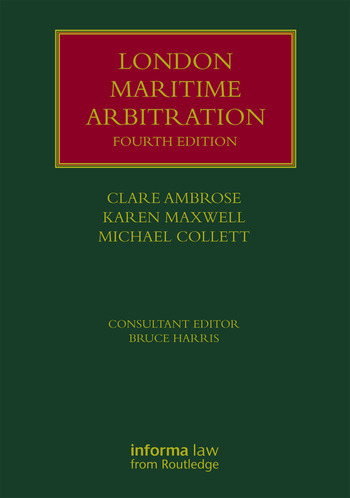 This unique title is the only book on the market that offers a practical focus on maritime disputes, while also providing a clear exposition of general principles of English arbitration law, with discussion and analysis of applicable legislation and case law. Arbitration practitioners will find everything that they need in one comprehensive book. Guidance on the new LMAA Terms 2017 against the background of English arbitration law, including the Arbitration Act 1996. Fully updated case law and analysis of legal developments, including Brexit. Comparative references to ad hoc and LCIA arbitration. New section on salvage arbitration, Brexit, third party funding. This book will be invaluable to maritime arbitration practitioners both in private practice and in-house, as well as maritime professionals, such as those working at P&I Clubs, brokers, ship owners, managers and charterers; and more generally to anybody concerned with London arbitration. Clare Ambrose is a barrister and arbitrator at 20 Essex Street Chambers. Her practice focuses on international trade, embracing shipping, commodities, insurance, banking and related disciplines. Clare is a Fellow of the Chartered Institute of Arbitrators, she is a Member of the London Court of International Arbitration; the London Maritime Arbitrators' Association (Supporting Member), and a Panel Arbitrator for the Singapore Chamber of Maritime Arbitration. Karen Maxwell is a barrister at 20 Essex Street Chambers. She practises in shipping, sale of goods, international trade, banking, private international law, arbitration and insurance. Michael Collett QC is a barrister at 20 Essex Street Chambers specialising in commercial law. His areas of practice include general commercial disputes, shipping, carriage of goods by road, international trade, commodities, conflicts of laws, insurance, reinsurance, banking and shareholder disputes. He appears both in Court and before a variety of arbitration tribunals. "The period since the financial and commercial crisis of 2008-9 has been particularly productive of reported cases on appeal from maritime arbitration awards. Some 200 new cases have been digested or noted in the new edition of this now-standard and authoritative work. ...it can be confirmed that the authors have succeeded admirably in what they set out to do, namely "to provide a concise and practical guide to maritime arbitration, but also to set maritime arbitration within the context of English arbitration more generally."